There followed a feast of spiced lentils-the distinctive spice is a red pepper called berberi-and other vegetables, served on a large platter and eaten without the bother of utensils, scooping up savory mouthfuls with torn-off bits of a soft bread called injera. Ethiopian tortillas? Not quite. These are spongier and more crpe-like, so airy light you can see the tiny bubbles. Afterward, Damanias served hot ginger tea, slightly sweet and deliciously aromatic. In 1994 Damanias was given the opportunity to move to California, where her future husband and his mother had relocated ahead of her. Not knowing what to expect, she once again left the familiar for the promise of a better life. “Everyone told me I would be crazy not to go,” she recalled, “and they hugged me and wept and wished me well. So I lost my country a second time.” She realizes how fortunate she is to have somehow landed in the Santa Ynez Valley, but one day-perhaps when her eldest son Massimo is 16-she hopes to return to her village for a visit. Her mother and siblings are still there, and she would love to stand again beneath the fig trees where everyone once waved good-bye. In the meantime, with the Blue Nile Cafe, Damanias has found a way to bring Ethiopia here. To request an Ethiopian meal, you need to call two or three days ahead and let her know you’re coming, but trust me: it is worth it. 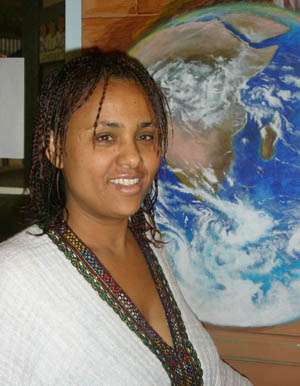 While you’re there, you can also admire the murals and artwork by her husband Gaimbero. And if you just happen to be in the neighborhood and haven’t planned ahead, you can still stop at the Blue Nile for sandwiches, pastries, and good robust coffee drinks, not to mention fast, free Internet access. But do say hello to Damanias, who will be quietly doing beautiful things with pride and care, Ethiopian style. 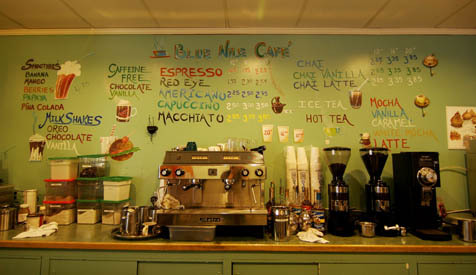 The Blue Nile Cafe is located at A-107 Denmarket Square, Alisal Road and Mission Drive, in Solvang. Call 693-0814.